Ten Speed Press, 9781607748441, 368pp. STUART BRIOZA and NICOLE KRASINSKI are the chef/owners of State Bird Provisions and The Progress in San Francisco. JJ GOODE is a Brooklyn-based food writer and the coauthor of the books A Girl and Her Pig with April Bloomfield, Morimoto with Masaharu Morimoto, Truly Mexican with Roberto Santibanez, and Pok Pok with Andy Ricker. "Beautifully written and photographed, this collection will inspire generations of diners and chefs to come." 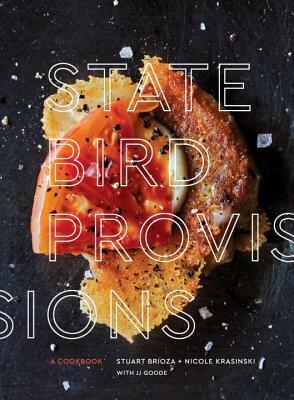 "[State Bird Provisions] is a pretty, fun-to-read cookbook, starting with the chatty backstory to the restaurant, which famously serves its food in dim sum carts." "The book itself does justice to the origin tale fans know well, and lends insight to the couple’s critical thinking approach to freshness, to waste, and to creativity. ... The photographs, just like the recipes, are gorgeous."